JUST ARRIVED IN STOCK THIS SEAT LEON 1.6 SE TDI DYNAMIC TECHNOLOGY 5 DOOR 114BHP ESTATE , THIS CAR COMES WITH MULTI SPOKE ALLOY WHEELS , REAR PARKING SENSORS AND IS FINISHED IN A METALLIC GREY PAINT, INSIDE WE HAVE A MULTI FUNCTION LEATHER CLAD STEERING WHEEL WITH CRUISE CONTROL BLUETOOTH TELEPHONE A CENTRE ARM REST, DAB RADIO, SAT NAV AIR CON ,ELECTRIC WINDOWS FRONT AND REAR AND ELECTRIC MIRRORS , UPHOLSTERY IS A DARK GREY CLOTH WITH A LIGHTER GREY CHECK . 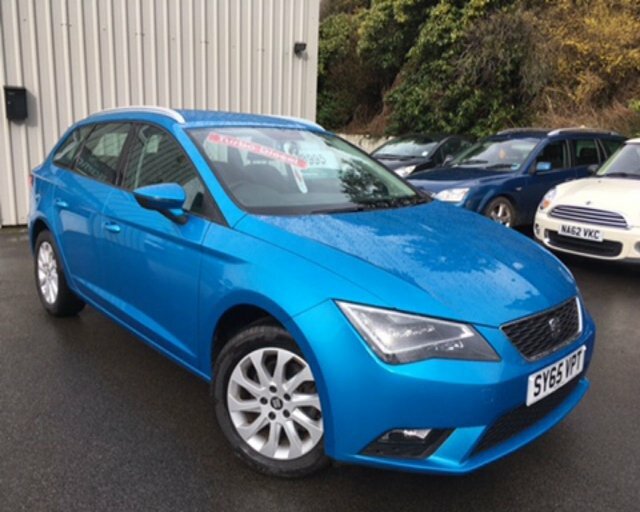 2015 65 SEAT LEON 1.6 TDI SE ESTATE TECHNOLOGY 110 BHP FINISHED APOLLO BLUE METALLIC WHICH IS COMPLIMENTED WITH BLACK CLOTH INTERIOR. THIS CAR IS ONLY £20 PER YEAR TO ROAD TAX AND WE RETURN YOU WELL OVER 50 MILES TO THE GALLON, IT ALSO COMES WITH A FULL SERVICE PRINT OUT AND HAS HAD ONLY ONE REGISTERED KEEPER FROM NEW. THE SE TECHNOLOGY COMES WITH MANY FEATURES SUCH AS ALLOY WHEELS, FRONT FOG LIGHTS, BLUETOOTH HANDS FREE CONNECTIVITY,DAB RADIO, CRUISE CONTROL, AIR CONDITIONING, AND A LEATHER CLAD MULTI FUNCTION STEERING WHEEL. CALL US TODAY ON 01228599900 TO ARRANGE A TEST DRIVE AND VIEWING WE OFFER P/X PRICES, AND FINANCE PACKAGES THAT CAN BE TAILOR MADE TO SUIT EVERY BUDGET. 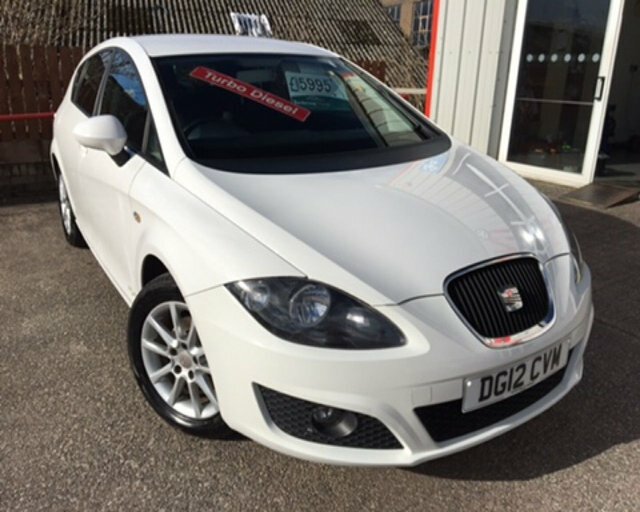 2012 12 SEAT LEON 1.6 CR TDI SE COPA 5 DOOR 103 BHP FINISHED IN CANDY WHITE WHICH IS COMPLEMENTED WITH BLACK CLOTH INTERIOR. THIS CAR IS IN STUNNING CONDITION THROUGHOUT AND DRIVES LIKE NEW, THE ROAD TAX IS ONLY £20 PER YEAR AND THIS CAR WILL RETURN WELL OVER 50 MILES TO THE GALLON. FEATURES THAT COME ON THE CR TDI SE MODEL INCLUDE ALLOY WHEELS, FRONT FOG LIGHTS, CRUISE CONTROL, MULTI FUNCTION LEATHER STEERING WHEEL, DUAL CLIMATE CONTROL, FRONT AND REAR ELECTRIC WINDOWS, BLUE TOOTH HANDS FREE CONNECTIVITY. CALL US TODAY ON 01768840111 TO ARRANGE A TEST DRIVE AND VIEWING WE OFFER EXCELLENT P/X PRICES AND FINANCE PACKAGES TAILOR MADE TO SUIT EVERY BUDGET. Available in a range of body styles, including as a three and five-door hatch and an estate model, the SEAT Leon combines sleek styling, an agile and responsive driving experience and day-to-day practicality. If you're ready to test drive one of the used SEAT Leon models for sale in Carlisle then be sure to contact a member of the team at Intercars Of Carlisle Ltd today. We'll do everything possible to get you a great deal on your next used car and ensure you find the right model to fit your lifestyle and budget. Feel free to contact one of our showroom team to discuss your options in more detail.